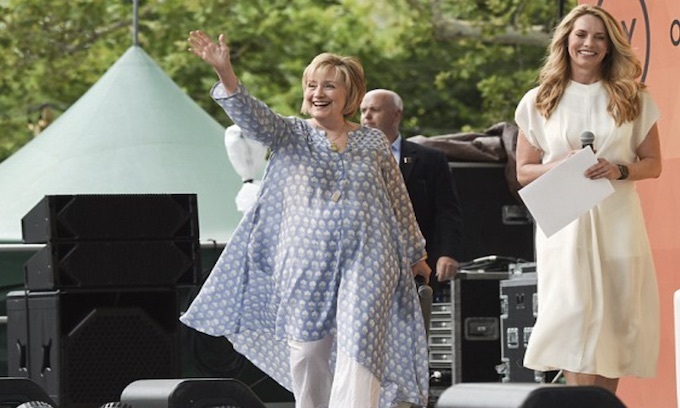 I’ve never seen Hillary looking ‘wider’ than she now does… but I guess this is no surprise. What is a surprise though is how she’s offering up her best ideas on how to get elected. What a joke! The only woman in American politics to have been handed an election on a silver platter… and she clearly blew it! As if that qualifies her as a pro? i will not be happy until i see her ugly mug in jail. Exactly. IF THERE IS ALL this evidence that she effectively COLLUDED with the FBI to in effect try to stage a coup, WHY IS NO ONE IN JAIL! Or better yet, WHY has no one been hung for abject treason! Three words: Lock her up! The dems have done far far worse than anything related to Nixon. Yet the liberal mainstream media ignores it completely. What a disgrace the liberal media has become. They are nothing more than pravda for the democrats. Which is why for over 2 years now, i’ve been wanting the FCC licenses YANKED from everyone of those libtard commie lovin networks! And as we will see, the double standard of justice will be applied to Hillary & her conspirator’s…as it always does….the so called authorities will just look the other way when it is all done & said…period! Hillary’s (& presumably people in her camp) M.O. has long been to use govt agencies to reward political allies & punish political opponents – IRS, FBI, FEC, DOJ, EPA, SSA, OSHA, SEC, FCC, you name it. In other words, everything she does is politicized; to her, there is nothing apolitical or neutral about govt agencies. They are to be used solely for advancing her & her political agenda just as they would be in a totalitarian regime, w/ her running the show, of course. Except for one itsy-bitsy, teeny-weeny little problem: 2016 voters had something else in mind. That the FBI was acting in concert with Team Hillary in her campaign is despicable & the ones who did so should be summarily fired, as were Comey & McCabe. Same with Obama & Hillary allies at DOJ. When Comey talks, he sounds like a jr-hi school drama queen: ‘Trump’s a mean girl & I was just doing the right thing’. It’s absolutely sickening to hear a FORMER FBI HEAD whine & speak like a disgruntled 9th grader. How he ever made it to the top of the FBI remains a mystery to me; I suppose it was b/c he’s taller than everyone else. WHY aren’t these folks already in Prison, or at least indicted? What has Mueller been doing for the last two years when this is so obviously a jail-able offense. Heck, people are going to jail over getting their kid into a college, shouldn’t trying to overthrow a President rise to that seriousness? Because NO ONE in the DOJ was doing their job! Maybe, just maybe the current AG will see to it that justice is served. Then everyone AT the DOIJ needs to be fired for gross incompetence then! remeber sandy berger stealing documents? Well, not completely. He was fined $10,000. Which the DNC paid, bless their generous hearts. Whooopy do. 10k for these folks is probably barely a month earnings..
It’s an absolute shame how the Democratic Party has evolved into the joke it is today. JFK must be turning over in his grave! However, he was kind of a ladies man wasn’t he? And dang, could Hillary get any fatter? They must use a cargo plane to transport her! Its not just shameful, but down right DISGRACEFUL to me. Looks like Omar-the-Tentmaker is back in business! “the witch” and her Coven will soon receive their personalized Orange Jump Suits. So far, i don’t see that the “Swamp” has been drained at all.. AND IMO TILL EVERYONE of these commucrats, socialist, and traitors are HUNG, i won’t consider it drained! I thought Ii heard a rumor that people go to PRISION for lying to the EF BEE EYE. So where are the indictments? Please note that John McCain is among the DEMOCRATS who stoked the fires crying out “collusion” with no evidence whatsoever; just empty accusations. John McCain and other never-Trump RINO’s fought against the rank and file of the Republican Party; trying to derail the nomination & election & presidency of Trump. This reveals that in 2012, there were two Democrats running for president (McCain and Obama) and zero Republicans on the ballot. Old Russian Proverb: “Democrat Hillary looks like sugar smells like ! Wake up Spineless GOP… I’ve been hearing this for YEARS and tiring of it ! Get to it and lock these CRIMINALS up. Unfortunarely, i don’t think our current crop of so called republicans will EVER find a spine.. That’s why i feel we need to kick them ALL OUT (along with every commucrat) and start afresh with new folk.